Sometimes the wheels come off your life all at once and it seems like something awful came out of nowhere to ruin things for you. While it can happen, life very rarely happens that way. Most often we ignore warning signs, hoping that problems will “just go away”. Over time we lose a slow war of attrition with age and relationship. While we are tempted to focus on the easier, more superficial concerns of our life the larger, more pressing and dangerous issues are building towards a tipping point. You knew I was talking about the Lakers all along right? Last week I posted about what Blazer fans could do to step up their game. It was mostly about objectivity. The objective reader tolerated it, those who lacked objectivity it hated it. Having objectivity is hard to achieve when you are a fan of a certain team. This is because you don’t learn objectivity while your team is good, you learn it during the lean years. Objectivity is built during the years immediately following your teams most successful period. This is when you learn just how quickly stars age and teams lose their ability to “hear” a coach… while cohesion crumbles. This is when most fans quit following their team. They stop paying attention for about 7 years. They wait until the team is rebuilt and then they return in droves once the winning begins… Because they want to enjoy, not learn from, the Nick Van Excel Lakers, the “jailBlazers”, or this year’s Cavaliers. Most often people don’t learn objectivity for two reasons: It’s difficult, and they don’t really want it. Part of the problem of having objectivity is that it ruins your ability to blindly enjoy your success in the moment. Objectivity means that you don’t trust your team in the playoffs even though they have one of the best regular season records. It means that you watch your star players treat their teammates and fans poorly, with an understanding that it’s going to have consequences down the road. These hints kill a playoff buzz faster than poor shooting or Steve Blake’s chicken pox. In these moments the average fan of ANY team, the populist, starts complaining about reffing and “star treatment”. They make accusations about conspiracy theories and gambling implications, but this is fiddling with the easy superficialities. The hard truth is that when the wheels come off, and they do for all but one team each year, the team wasn’t good enough. The signs were there all year and you didn’t have, or want, the objectivity to have seen it coming. 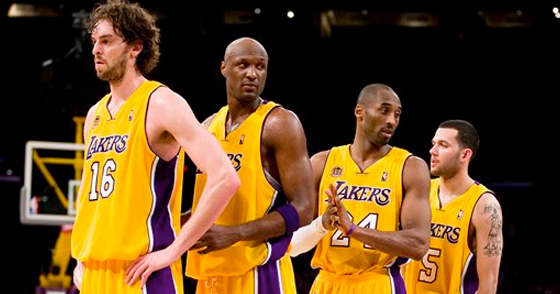 -When they no longer needed each other for rings, Kobe & Pau would end up just like Kobe & Shaq. -If you can’t defend a point guard, you can’t play defense. -If Dennis Rodman’s crazy eventually wore everybody around him down, so would Ron’s. -If you still need a coach to “motivate” you, you aren’t really a professional. -Length only helps you when you want to rebound and play defense… As opposed to shoot. -A sixth man should be a role player, not someone too distracted to be a starter. -You can’t “trust” a jerk to play nice… Ever. Even if there’s some kind of *Miracle, the **rebuilding has to begin this offseason because teams like Oklahoma City and Portland already have their young pieces in place. With a lockout looming, the next few years will not be kind to the Lake show. The question for the fans is whether or not anyone wants to learn anything, before the wheels “suddenly” come off the next time. Don’t let this post only be about basketball. What is it that you are turning a blind eye to because you are “a fan”? Get help before the sudden disaster. *”miracle” means not getting swept. **rebuilding means “buying a kid from Orlando”… again. Don’t worry have a down year next year shed salary and then bring in Dwight. Don’t be surprised to see Bynum and a host of others get traded for him (and am undisclosed sum) before the lockout… Because Orlando won’t want to lose him for nothing. Loved this post for its non-basketball implications. So true that things don’t normally just blow up over night. I think I’ve had this perspective of churches/movements. That is, I’ve become a “fan” of a particular season. I’ve purchased the DVD series, read the leadership books, listened to the podcasts, and joined the overall hype of elevating a style/personality. What drives it? I want to be associated with something that is succeeding, even if it’s living vicariously through the players while I’m on the sidelines. To stretch the metaphor…I think this where the invitation of Jesus comes in. He beacons me to move from spectator to player. He calls me into the game. But the moment I step onto the field I realize I define better as “winning.” When He defines better as self-sacrifice and surrender. So true Milo. I find myself reading the Gospels and identifying with the Pharisees (embracing popularity) more than I want to. Although it would be more apt to call them the “failLakers”, feel free to call them the “jailLakers”… you could have started when they picked up Isaiah Rider during their first three Championships. The only thing more embarrassing than this season’s finish is when the same thing happened against the Pistons in the 2004 Finals.